Senior executives at one of the world’s richest conservation groups, the World Wide Fund for Nature (WWF), are at loggerheads over a corporate sponsorship deal that will affect the fate of three species of goose. The dispute involves plans for a major dam being built by Alcoa, an aluminium giant with unusually close ties to WWF’s American arm. The dispute has led to angry exchanges between the organisation’s US president and its international director general, dissent among WWF’s UK staff, and criticism of its ties to big business from leading British conservationists. The row focuses on Alcoa’s controversial scheme to build a hydro- electric dam complex covering 22 square miles at Karahnjukar in Iceland, that will destroy nesting and feeding areas for geese which spend the winter in Britain. The dams will flood the nesting areas for 7,600 rare pink-footed geese which winter in Scotland, Lancashire and East Anglia – an eighth of the total that winter in Britain. It will also wreck the so- called “staging areas” for tens of thousands of barnacle and greylag geese that stop off in Iceland en route to Britain from Greenland. The Royal Society for the Protection of Birds (RSPB) and the Wildfowl and Wetlands Trust (WWT) said the plan was disastrous and would have a serious impact on eco-tourism across the country. “Watching the geese fly in is one of the UK’s greatest wildlife spectacles,” said Lloyd Austin, an RSPB expert. The row took a fresh twist after it emerged that Alcoa is one of WWF- US’s small group of “corporate club” members which have donated $1m (pounds 620,000) or more to become associated with the organisation. In return, Alcoa has given a seat on its executive board to Kathryn Fuller, the president of WWF-US and a prominent environmentalist. However, Ms Fuller refused to vote against Alcoa’s decision to push ahead with the Iceland project. Instead, she abstained when the vote was held, leading to a direct confrontation with Dr Claude Martin, the head of WWF International. It is understood that Dr Martin suggested that Ms Fuller should resign from Alcoa – a request that she rejected. 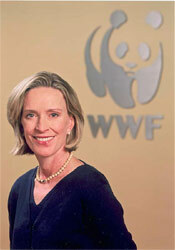 She said remaining on its board allowed WWF to influence other Alcoa policies. “You have an opportunity to steer the ship if you’re on the bridge,” she said. The organisation’s executives in the UK and Geneva admit this is the most serious crisis so far in its relations with big business. But British environmentalists claim this is just the latest in a series of questionable relationships. Earlier this month, the outgoing director of Friends of the Earth (FoE) Scotland, Kevin Dunion, attacked the links between WWF and the French- owned mining and quarrying company Lafarge. Mr Dunion is furious with WWF for continuing to have a very close relationship with Lafarge because the company has refused to abandon plans to create a vast “super quarry” on the Hebridean island of Harris. In a blunt letter to Dr Martin, Mr Dunion accused WWF of “colluding” with Lafarge in its campaign to discredit its critics. The row has soured relations between FoE and WWF, though WWF executives privately believe Lafarge is highly unlikely to press ahead with the Harris quarry. But if it did so, they would pull out of their alliance with Lafarge. Last year, The Independent on Sunday revealed that there was growing discomfort among environmentalists about WWF-UK’s pounds 35m deal with the bank HSBC to fund a series of environmental projects around the world. The deal – the largest-ever corporate donation to the environmental movement – was condemned by FoE as “green washing” because of HSBC’s investment links to forestry operations in Indonesia, the Three Gorges dam in China and a dam in Lesotho, southern Africa. However, Dr Martin has insisted that the organisation press ahead with its attempts to forge close ties with the world’s largest corporations. Multinationals are now more powerful than nation states, he said, so green groups had to work closely with them.